It was only a matter of time before the discussion shifted from "Will the Eagles fire Andy Reid?" to "Who will the Eagles hire after the Eagles fire Andy Reid?" But everything seems to have exploded today, and all it took was the injection of one potential replacement that would satisfy Philadelphians' masochistic need for unnecessary soap operas. Jon Gruden! Jon Gruden would be perfect for Philly. He could take Nick Foles under his wing. He could leave the defense to someone who knows what they're doing. He could get off my TV. The Gruden-to-Philly thing kind of blew up out of nowhere, with some ominous, poorly sourced reports. WalterFootball says he's reaching out to potential assistants, asking what they're going to be doing next year. Howard Eskin claims he's interested in coaching again (and if you can decipher the rest of this cryptic tweet, holler). Crossing Broad has him being mobbed by Eagles fans at the New Orleans airport earlier this week, begging him to return to Philly, where he was the offensive coordinator from 1995-97. 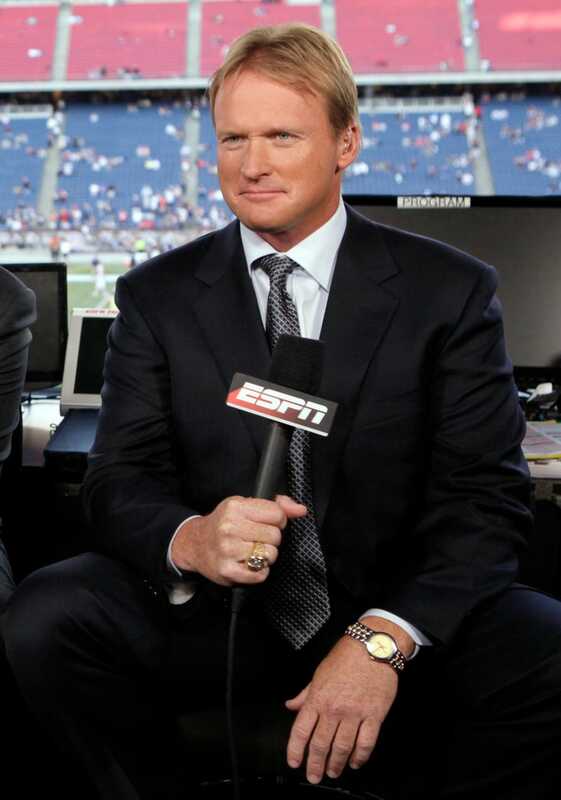 Where does this fit in that other twitpic'd airplane photo of Gruden nebulously tying him to a different job? No one knows! The last thing that the Eagles need is another celebrity as a coach. By dint of a media nearly as bloodthirsty as the fanbase, there's always going to be drama. Some places handle this with a no-nonsense coach who disarms trouble through sheer force of will—Bill Belichick and Tom Coughlin come to mind. Others distract from locker room turmoil with an more newsworthy figurehead—Rex Ryan, say. Andy Reid has ruled Philly for 14 years through a combination of on-field success and threats to cut off reporters' access if they dig too deeply. Does Jeff Lurie really want to hire another little dictator in Gruden, more verbose and demonstrative than Reid but no less vindictive, just as prone to making the back-page for reasons other than his team's play? Ditch the most controversial player of the last decade, and the albatross-walrus on the sideline. Rebuild with a boring quarterback and a boring head coach. Doing it quietly is doing it right, and a TV star doesn't fit into that process.